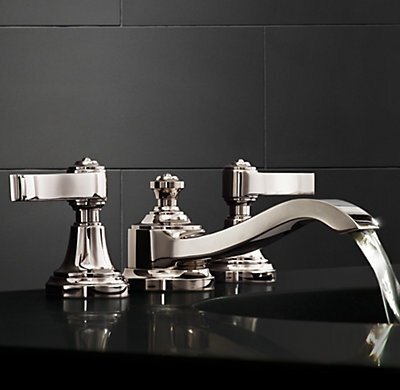 This is a 'Campaign' faucet from Restoration Hardware and it's huge - a monster, really. Or it was, until they discontinued it after we bought ours at clearance pricing. (you can still buy the tub filler.) But I'm not telling you about how we have now discovered it may simply overwhelm our shallow counters, or about the other faucets we had to replace in a hurry today because the counters are coming in soon and we decided we really don't like the ones we'd picked originally. Instead, we'll be talking about Going To The Physiotherapist. Are you excited? I was, till I realized how much this is gonna hurt!! I chose my physiotherapist based on two factors: location and location. I left out the traditional third location - the office is not a deluxe glam-decor relaxing space like my orthodontist's, which seems unjust because frankly I have less pain at the orthodontist's. But the first 'location' is important, since we are likely to be moving halfway through my treatment program and I want to be able to get there easily from both condo and house, and the second 'location' is pretty nice too - you can get there through PATH which means I can stay dry on rainy days like yesterday, when I went for the first time. I can live without glam. As an added bonus, the geographic location puts it just over the intersection that stands between Old and New City Hall here in Toronto and the view from the windows is AMAZING. I have never seen Bay Street from this angle, though I have walked it many many times over the years. The elevated view makes it looks SO much more beautiful and also, foreign and unfamiliar. It fascinated me to have the chance to see Toronto for the first time again even though I've been coming here since I was five and moved here more or less permanently at eighteen. Somebody was skating on the rink in Nathan Phillips Square in front of new city hall as I waited for my appointment. It was raining, and surely the rink was mostly melted? but there was this guy, bundled up and gliding around with much finesse. Later I watched a Zamboni slowly moving around the ice to clean up all the shavings, like it wasn't rainy out and about 7 degrees Celcius. It was nice to be taken out of myself and the pain of my hand to see all that, before I had to lie down and try to breathe through having my fingers and hand bent into the positions they used to be able to achieve by themselves without consequence. I would like to point out that I did not swear during all that. I was able to resist because I am pretty sure the pain was not worse than the pain from the eight needles I had to have before having the reduction in Emerg. for my two broken fingers, though I might be in denial, and since I didn't swear during that I wasn't going to cop out during physio. But it wasn't that I didn't desperately want to both times - I just didn't want to hurt the feelings of the guy who was creating agony in order to help me. I mean, how much does it stink to have a job where you have to hurt people at regular intervals, even though you know it's helping them in the long run?? After the painful part, which came with tips on how to stretch out at home the tissues that shrank while I was in the splint, I got some ultrasound treatment on my two broken fingers. And let me tell you, if I could have had that on all four fingers? HEAVEN. Because it really knocked down the stiffness, and even some of the swelling. I mean, after nine weeks of sausage fingers, you are really ready to have that extra fluid go somewhere else and give your skin and joints a break. Sadly, that wasn't allowed. But the pots of hold and cold water are. I wish I'd known about this trick before because it's amazing. First, you have to find two pails and a way to comfortably hang out with them for twenty minutes or so while sticking your hand into them. My solution is two stock pots resting in the sink at the kitchen, and boy am I glad the condo has a double sink and not a skinny single. Then you fill one with water as hot as you can stand, and the other with water as cold as you can stand. Then you stick your hand in the hot water, clenching a fist and then stretching out your fingers as straight as they'll go, over and over for three minutes. Then you plunge your hand into the cold water and make fists and stretch all over again, for half as long. For twenty or so minutes you go back and forth with this, and the idea is to trick all the gory stuff inside your hand to wake up already and start pumping out all the excess fluid because after nine weeks it's not like it can pretend to be doing anything more impressive than learning to play poker, which frankly isn't as helpful as letting me have the use of my hand back. All these exercises take a ton of time and just the one session with the physiotherapist was so enormously painful my hand was sore the rest of the day and I couldn't face typing a Hugs post. I couldn't even tap out an e-mail to anybody and that's pretty unusual for me. But then today, as part of the faucet choice/fireplace installation/garbage bucket hardware crisis, when I had to pick up the faucet and try to photograph it for Andy to see? WHOA. My wrist was really, really not up for that task. And if I can't pick up a faucet, how am I going to be able to pack to move back home? I just gotta do the physio, I guess. And if I do the physio, maybe it will hurt less when I go back for the next session. We live in hope. Hope you've been having a great week! I'd stick around and not tell you about faucets some more, but there are some buckets of water calling my name. Oh! I do so sympathise and empathise. After a knee replacement whicch didn't work out I had physio for TWO YEARS and it still isn't right. Your broken bones on the other hand, (no pun intended but it made me smile all the same), will be fine. Good luck with the house move. I love moving house, but then I'm a bit strange! I'm in the throes of sorting out after moving from a large four bedroom house with a garage and outbuildings to a small three bedroom house with no storage, no garage or shed. The problems are my yarn stash, my fabric stash, art and craft equipment and diy stuff. Much more difficult than the actual move. The charity shops have received 98% of my wardrobe forcing me to use some fabric stash. How's that for a creative solution? PS - your tap is very elegant even if large. Omigosh Kathy, is your knee ever going to be back to what it was after you've worked so hard? One thing that surprised me in my own situation is that I know somebody who did the bare minimum of PT after knee replacement and I could NEVER understand how 'it hurts' was a good reason not to fight for full mobility. Now of course I totally get it, ha. Sometimes it feels like enough just to be able to type and knit. I have a whole new appreciation for people who come back after stroke or bad car accidents that's for sure! Love your idea for wardrobe reduction! We did a custom closet to make the most of the space we have for it but it is still pretty small, so I am pruning to a micro wardrobe of linens and silks and cottons and wool to wear year round. Only a few things will go out of season, everything else is for layering in winter and not, in summer. I will be a happy girl if it works out! Hey Mary - My knee ops were done in France and I went to a different surgeon for the second and have had no trouble whatsoever with that. He was brilliant, (and lovely with it), and I pleaded with him to have a go at the first for me but he wouldn't. I assume a case of medics sticking together and not being seen to criticise a colleague. I recently moved back to the UK though so I'm going to ask my GP if he can recommend a good knee surgeon I can talk to about it. After 5+ years though I suspect it may be too late. Well see. I do feel a bit of an idiot having to go up and down stairs one step at a time like a child! Even knowing that there are so many much worse off, and how I admire them for struggling through, these are *our* problems directly affecting *our* ability to live life as we want to so it's understandable that they loom large!